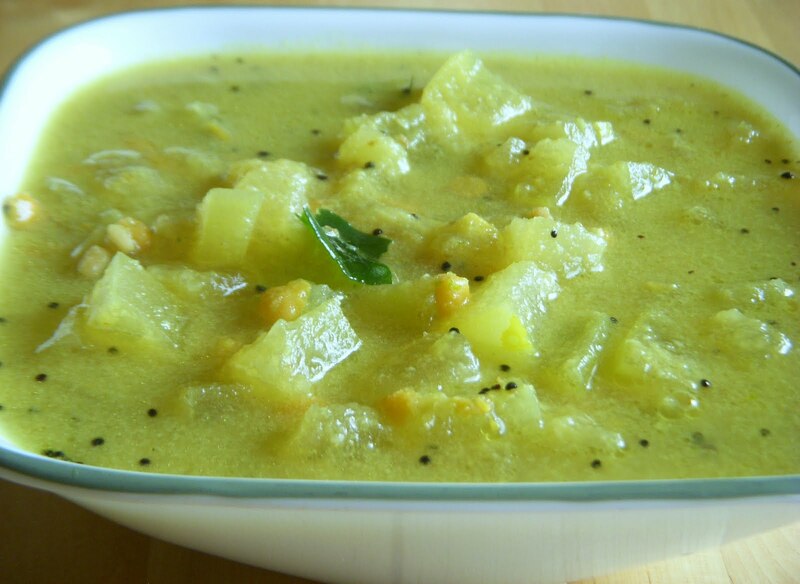 This is a delicious and simple South Indian kootu made with 3 different vegetables – Yellow Pumpkin, White Pumpkin and Bottle Gourd. Typically kootu is made using only one vegetable. Serve this with hot rice and a side dish of choice. Peel the outer skin of the pumpkins and bottle gourd. Deseed and finely chop. Grind the coconut, jeera, green chillies and feenel seeds with little water to a thick paste. Soak the dals in water for 30 minutes. Take a pressure cooker and cook the dals, vegetables,salt, turmeric powder by adding the required water. Take a pan and heat the oil in a medium flame. When the oil is heated up, add the mustard seeds, curry leaves and asafoetida. WHen the mustard seeds is splattered, add the chopped onions and tomatoes. Saute for a minute or until the onions turn brown. Add the grinded paste, cooked vegetables and dal to it and mix well. Add red cilli powder, turmeric powder, and salt. Pour little water and cover with a lid. Cook for 5 minutes and remove from flame. Feel free to comment or share your thoughts on this Mukkootu Masiyal (3 Vegetables Kootu) Recipe from Awesome Cuisine.